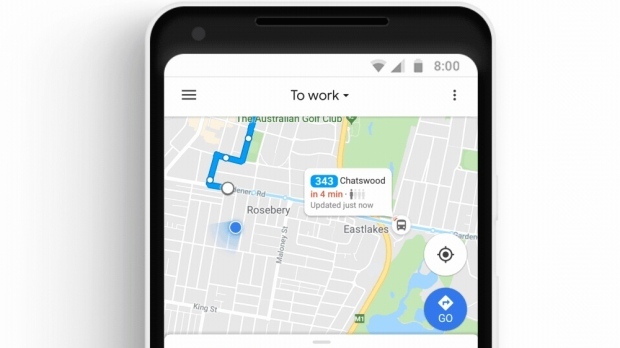 Google Maps is launching a new commute tab this week, aimed at helping users shave time and stress from their daily commute to work. Instead of wolfing down your breakfast, spilling coffee on your pants, and sprinting for the train or subway only to find yourself caught in a 15-minute delay, commuters can consult the new tab to see exactly where their bus or train is on the map in real time. The feature for transit riders will roll out across 80 regions worldwide. Drivers will also be able to use the commute tab to see if they'll need to budget extra travel time for accidents, heavy traffic or road construction. In the case of delays, the Google Maps will offer alternative routes. For Android users, drivers will receive notifications about delays and disruptions en-route in real-time, so that commuters can take an alternate route before getting caught up in traffic. Google has also integrated music streaming apps like Spotify, Apple Music and Google Play Music into Google Maps, so that drivers can control their music directly from the Google Maps navigation if they do end up getting stuck in traffic. For commuters who use all forms of transportation on their commute -- car and public transit -- they'll be able to consult the tab on when to leave for each leg of their trip in order to make it to work on time. According to Google Maps data, people in North America spend the equivalent of a two-week vacation commuting to work every year. The commute feature will roll out globally on Android and iOS this week.